Is married.....wife's name is Caroline.....the couple has two daughters, Alana and Veronica...Has struck out 387 batters in 303.1 innings over his Major League career (11.48k/9ip) while holding opponents to a .209 batting average...Pitched for Team Colombia in the 2017 World Baseball Classic...Tied for seventh in the American League with 37 saves in 2013...Was a "Final Vote" candidate for the last American League All-Star roster spot in 2012 along with fellow pitchers Yu Darvish (Texas-winner), Jonathan Broxton (Kansas City), Jason Hammel (Baltimore) and Jake Peavy (Chicago)...Was a Pacifc Coast League All-Star in 2010...Was a Texas League All-Star in 2009...Follow him on Twitter (@ernasty49). Began season with Los Angeles (AL), where he went 11-for-14 in save opportunities ... Did not allow a run in six appearances (6.0 IP) while pitching in the eighth inning ... Allowed two runs in 1.0 IP while making his season debut on 4/2 before making four straight scoreless appearances (4.0 IP) ... Recorded first save on 4/9 at Seattle ... Went 6-for-6 in save opportunities with a 1.17 ERA (15.1 IP/2 ER) and .120 batting average against (6-for-50) in 15 appearances from 4/25 to 6/1 ... Was scored upon in four of his last five appearances with the Angels ... Was acquired by the Pirates on 6/27. Finished 2-4 with 37 saves, a 3.80 ERA (68.2 IP - 29 ER), 98 strikeouts and 30 walks in first full season with the Angels... Established or tied career bests in saves (37), innings pitched (68.2), games finished (51), games (67) and strikeouts (98)…His 3.80 ERA set a career high, while 51 hits and 11 home runs allowed were also career highs... Among AL relievers ranked eighth in saves, ninth in games finished and third in strikeouts...Also ranked second among AL relievers with a .155 (22/142) batting average against vs. left-handed hitters in 2013... Led the Majors with seven saves of more than three outs…Most in MLB since Brian Wilson (10) and Carlos Marmol (8) in 2010... 37 saves in 2013 were most by an Angel since Brian Fuentes had 48 in 2009... Became sixth pitcher in Angels history to reach 35-save plateau in a single season, joining Francisco Rodriguez, Troy Percival, Fuentes, Lee Smith and Bryan Harvey... Earned a win or save in 13 of last 17 appearances of 2013... In final 15 games (after August 10th), compiled a 2-0 mark with 10 saves and a 1.66 ERA (21.2 IP - 4 ER) with 29 strikeouts... Stranded 20 of 23 inherited runners in 2013. Entered campaign as longest tenured player in Padres organization, having originally signed in January 2003...Registered 1-0 record with 2.31 ERA and 18 strikeouts in 11.2 innings for San Diego before being acquired by Angels on May 3 in exchange for Minor Leaguers Alexi Amarista and Donn Roach...Made Angels debut May 5 vs. Blue Jays...With Angels, established career highs and led all Halo relievers in wins (4), saves (23), and strikeouts (80) in 56 appearances...Posted a 4-2 record with a 2.32 ERA (54.1 IP - 14 ER) with LAA...Overall, was 5-2 with a 2.32 ERA (66 IP - 17 ER) and a career high 98 strikeouts in 67 total outings with Padres and Angels...Strikeout total ranked fourth among Major League relievers...Tied for MLB lead in 4+ out saves with five (Jason Motte & Rafael Soriano)...Recorded 20 strikeouts in first nine innings of Angels career, while holding opponents hitless...Joined Roger Clemens, Kerry Wood and Randy Johnson as a member of 20 K's in 9 innings club...Did not allow a hit in first 13.1 IP with Halos, and became first pitcher in MLB history to make 13 consecutive outings without allowing a hit to begin his tenure with a particular team (ELIAS)...Prior to All-Star Break, converted all 11 save opportunities (led club), while registering seven holds...Angels were 25-1 in games he pitched during first half...Became first Angels reliever in club history to not allow a single run before All-Star Break (min. 10 IP)...Struck out 45 of 105 first half batters faced (averaging 15.5 strikeouts per nine innings) to become first MLB pitcher with 45+ strikeouts and zero earned runs in first 25+ innings with a new club (STATS LLC)...Selected as one of five American League candidates for final All-Star roster spot in "Final Vote" campaign...String of 26 consecutive games without allowing a run is second most in franchise history, trailing only a 2006 stretch of 30 games by Francisco Rodriguez...Streak of 26.1 consecutive scoreless innings ranks tied for third longest in Angels history...Only K-Rod (30.2 IP in 2006), and Bob Lee (27 IP in 1964) had longer scoreless inning streaks for Halos...Combined with final SD appearance, recorded 27.1 consecutive scoreless innings pitched; tied w/ Tampa's J.P. Howell for longest streak in MLB in 2012...For season, converted 23 of 26 save opportunities...Angels were 49-7 when he pitched in 2012...Finished two strikeouts shy of century mark...In three seasons from 2009-11, only 10 relievers eclipsed 100 punch outs. Posted career highs in games, innings pitched and strikeouts for the Padres after being named to his first Opening Day roster...Hit a career-high nine batters, setting a franchise record for hit batsmen by a reliever...Missed 15 games from 8/6-21 while on the disabled list with a lower back strain...did not allow a run in his 13 appearances after being reinstated from the DL...Ranked ninth among NL relievers with a 10.86 strikeout/walk ratio...Missed three games from 7/26-28 while on the paternity list. Recalled from Triple-A Portland on 7/16, spending therest of the season with the Padres...Dating back to his Major League debut on 9/26/09, started his careerwith 12 straight scoreless outings from 9/26/09-8/6/10 (10.2 IP), tyingJeremy Fikac (8/16-9/8/01) for the most scoreless outings by a Padreto start their Major League career...Held his first 18 batters faced in the Big Leagues hitless...Allowed only one earned run in 15 outings at home for the Padres(0.66 ERA, 1 ER/13.2 IP)...Held right-handers to a .156 (12-for-77) opponents batting average while lefties hit just .176 (6-for-34) off him...Ended the season by not allowing an earned run over his last 14 outings (13.2 IP)...Converted 17 of 19 save opportunities for Triple-A Portland while allowing just a .114 (14-for-123) opponents battingaverage over 34 outings for the Beavers. Spent the year with Double-A San Antonio before being called up 9/14 and making his Major Leaguedebut with the Padres.Made two relief appearances for the Padres, including his Big League debut 9/26 at ARI...worked 1.0 scoreless frame in eachouting...recorded two strikeouts and one walk without allowing a hit...Pitched primarily as a starter at San Antonio, making 26 starts and one relief appearance...relief outing was 5.0 scorelessinning of work 5/21 vs. Corpus Christi...Limited opponents to a .237 average, including a .210 mark at home and .276 on the road...Tallied four wins in five starts during the month of May, posting a 3.91 ERA (11 ER/25.1 IP)...posted a 2.96 ERA in July (9ER/27.1 IP). Split the season between Single-A Lake Elsinore, Double-A San Antonio and Triple-A Portland,appearing in a total of 36 games (21 starts)...Set career highs in starts, innings pitched (140.2) and strikeouts (125)...Limited opponents to a .246 batting average (132-for-535)...Made 21 starts in 2008 after having made 12 over the previous five years of his professional career. Split the season between Single-A Fort Wayne and Single-A Lake Elsinore...went 1-2 with a 2.64 ERA (19 ER/64.2 IP) in 40 relief appearances with the Wizards...struck out 65, averaging over 9.0 strikeouts per 9.0 IP...allowed just three earned runs over 21.2 innings of work (1.25 ERA) with the Storm...made 12 relief appearances and one start with Lake Elsinore...combined for a 2.29 ERA (22 ER/86.1 IP) in 53 appearances in 2007, limiting opponents to a .196 (59-for-301) batting average. Spent the majority of the season at Short-A Eugene (27 games, one start), while also making twoappearances at Lake Elsinore and one at Fort Wayne...ranked as the 17th-best prospect entering the 2006season according to Baseball America...Did not allow a home run in 17 consecutive appearances (21.2 IP) from 7/29-9/6...Left-handers hit .151 (8-for-53) against him while with Eugene. Split the season between Rookie-level Peoria and Single-A Lake Elsinore, making 19 appearances(five starts)...Paced the entire organization with a 1.27 ERA (7 ER/49.2 IP) overall...Led the Arizona League with a 1.17 ERA (6 ER/46.1 IP) and paced all relievers with a .122 opponent batting average...alsoranked among league leaders in wins (T-1st, 7), strikeouts per 9.0 innings (5th, 12.69) and fewest base runners per 9.0innings (5th, 8.13)...Went 6-0 with a 0.65 ERA (2 ER/27.2 IP) in 12 games from 7/19-8/30 with Peoria. Spent the entire season with the DSL Padres, appearing in 21 games (one start). Began his professional career with the VSL Padres, making 15 appearances (four starts). October 31, 2018 Yaquis de Obregon reassigned RHP Ernesto Frieri to the minor leagues. October 21, 2018 RHP Ernesto Frieri assigned to Yaquis de Obregon. October 21, 2018 Yaquis de Obregon placed RHP Ernesto Frieri on the reserve list. October 9, 2018 RHP Ernesto Frieri assigned to Yaquis de Obregon. April 21, 2018 Acereros del Norte released RHP Ernesto Frieri. April 5, 2018 Acereros del Norte signed free agent RHP Ernesto Frieri. March 18, 2018 Colorado Springs Sky Sox released RHP Ernesto Frieri. 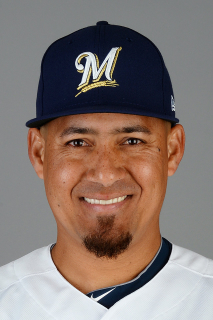 January 19, 2018 Milwaukee Brewers signed free agent RHP Ernesto Frieri to a minor league contract and invited him to spring training. January 19, 2018 RHP Ernesto Frieri assigned to Colorado Springs Sky Sox. November 14, 2017 Charros de Jalisco placed RHP Ernesto Frieri on the reserve list. October 10, 2017 RHP Ernesto Frieri assigned to Charros de Jalisco. October 2, 2017 RHP Ernesto Frieri elected free agency. August 9, 2017 RHP Ernesto Frieri assigned to Tacoma Rainiers from Seattle Mariners. August 8, 2017 Texas Rangers traded RHP Ernesto Frieri to Seattle Mariners for cash. July 22, 2017 Round Rock Express activated RHP Ernesto Frieri from the 7-day disabled list. July 17, 2017 Round Rock Express placed RHP Ernesto Frieri on the 7-day disabled list retroactive to July 15, 2017. July 7, 2017 Texas Rangers sent RHP Ernesto Frieri outright to Round Rock Express. July 4, 2017 Texas Rangers designated Ernesto Frieri for assignment. June 17, 2017 Texas Rangers selected the contract of RHP Ernesto Frieri from Round Rock Express. June 17, 2017 Texas Rangers activated RHP Ernesto Frieri. June 15, 2017 Texas Rangers signed free agent RHP Ernesto Frieri to a minor league contract. June 15, 2017 RHP Ernesto Frieri assigned to Round Rock Express. June 4, 2017 Scranton/Wilkes-Barre RailRiders released RHP Ernesto Frieri. April 3, 2017 RHP Ernesto Frieri assigned to Scranton/Wilkes-Barre RailRiders. March 16, 2017 New York Yankees signed free agent RHP Ernesto Frieri to a minor league contract and invited him to spring training. October 22, 2016 RHP Ernesto Frieri assigned to Aguilas del Zulia. April 5, 2016 Lehigh Valley IronPigs released RHP Ernesto Frieri. April 2, 2016 RHP Ernesto Frieri assigned to Lehigh Valley IronPigs. April 2, 2016 Lehigh Valley IronPigs activated RHP Ernesto Frieri. December 14, 2015 Philadelphia Phillies signed free agent RHP Ernesto Frieri to a minor league contract and invited him to spring training. October 16, 2015 RHP Ernesto Frieri assigned to Gigantes del Cibao. October 5, 2015 RHP Ernesto Frieri elected free agency. September 1, 2015 Durham Bulls activated RHP Ernesto Frieri from the 7-day disabled list. August 14, 2015 Durham Bulls sent RHP Ernesto Frieri on a rehab assignment to GCL Rays. July 9, 2015 Durham Bulls placed RHP Ernesto Frieri on the 7-day disabled list retroactive to July 8, 2015. June 21, 2015 Durham Bulls activated RHP Ernesto Frieri from the 7-day disabled list. June 13, 2015 Durham Bulls placed RHP Ernesto Frieri on the 7-day disabled list retroactive to June 10, 2015. June 8, 2015 Durham Bulls activated RHP Ernesto Frieri. June 5, 2015 Tampa Bay Rays sent RHP Ernesto Frieri outright to Durham Bulls. June 2, 2015 Tampa Bay Rays designated RHP Ernesto Frieri for assignment. November 26, 2014 Tampa Bay Rays signed free agent RHP Ernesto Frieri. September 2, 2014 Indianapolis Indians released RHP Ernesto Frieri. August 13, 2014 Pittsburgh Pirates sent RHP Ernesto Frieri outright to Indianapolis Indians. August 8, 2014 Pittsburgh Pirates designated RHP Ernesto Frieri for assignment. June 27, 2014 Los Angeles Angels traded RHP Ernesto Frieri to Pittsburgh Pirates for RHP Jason Grilli. May 4, 2012 Los Angeles Angels activated RHP Ernesto Frieri. May 3, 2012 San Diego Padres traded RHP Ernesto Frieri to Los Angeles Angels for 2B Alexi Amarista and RHP Donn Roach. November 22, 2011 RHP Ernesto Frieri assigned to Navegantes del Magallanes. August 21, 2011 Ernesto Frieri roster status changed by San Diego Padres. August 12, 2011 sent RHP Ernesto Frieri on a rehab assignment to Tucson Padres. August 8, 2011 San Diego Padres placed RHP Ernesto Frieri on the 15-day disabled list retroactive to August 6, 2011. Back problem. July 29, 2011 San Diego Padres activated RHP Ernesto Frieri from the paternity list. July 16, 2010 San Diego Padres recalled RHP Ernesto Frieri from Portland Beavers. March 28, 2010 San Diego Padres optioned Ernesto Frieri to Portland Beavers. September 14, 2009 San Diego Padres recalled Ernesto Frieri from San Antonio Missions.